In early October 2015 McDonald's Denmark, Sweden and Finland all simultaneously launched the "Homestyle" combo. I had secretly hoped that the promo might have finished by the time The Wife and I visited in November as it was a bit too similar to the Create Your Taste DIY 'gourmet' burgers which are making their way around Asia (first in Singapore, but now in Hong Kong & Korea). Unfortunately, it was still available in November, and since it was the only real burger worth trying, I still gave it a go, even if it was a whopping 75DKK ($10USD+) for the combo! After the last time I had McDonald's in Denmark, I knew it was going to be an expensive lunch. 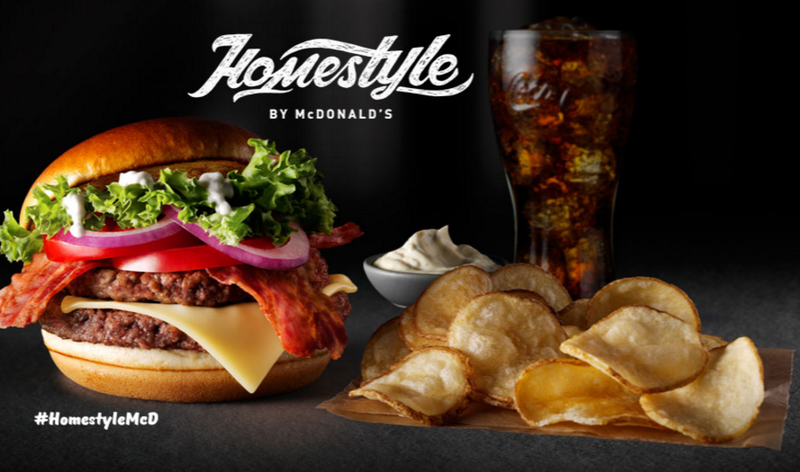 The sandwich was being touted as a "deluxe homestyle burger" using premium ingredients, most of which were not available on any other burger on the menu (aside from the tomato and beef). It included 2 massive all-beef patties, 2 strips of bacon, unprocessed emmental cheese, whole leaf lettuce, red onions, a 'shiny' bun, topped off with Lemon Mayo and that slice of tomato. These were certainly larger beef patties than I would get in Asia, I suspect they were re-purposed Big Tasty (Big 'N Tasty) patties. The rest of the ingredients themselves were actually pretty good as well, and although my lettuce looked a little wilted, the rest made my burger look fresh and vibrant, it definitely didn't look like a typical McDonald's burger (the paper wrapper was a nice touch as well) the only problem was with the taste! As pretty as the burger looked on the tray, I was pretty disappointed once I took my first bite. Although I placed my order during the busy lunchtime rush and the restaurant was busy, my burger was served completely at room temperature. That meant both large beef patties were dry, and they had next to no seasoning on them. The cheese tasted like it had been melted a very long time ago, and had since re-solidified on the burger, the only upside was that it still looked like real cheese. Even bigger let downs were the two slices of bacon and the lemon mayo. Neither added any extra flavour to the sandwich at all. The bacon didn't even have any crispiness to it, and was served completely limp (you have to almost be trying to make bacon flavourless...), and if someone told me that the "lemon mayo" was just standard mayo, I would have believed them. I even tried to dip one of my fries in the sauce to see if I could get any lemon out of it...nothing. During our 6 days in Denmark, this was easily the worst meal we had on our trip.